This last day of June usually finds me making some preparations for a season that doesn't start until November. Well I'm jumping ahead a bit in this post, so the preparation stuff will come later. Tomatoes. Most of the tomatoes we have here now are store bought. The local native ones are about a week or so away from making it to the farm stands, and I can't wait. Store bought tomatoes are without flavor, they make terrible sandwiches, and to put them in a salad will insult the fine lettuce they sit with. There are a few things one can do with these non-native fellows that make them quite good. I start with Roma tomatoes, drop them into boiling water for a few minutes until the skins split. I them remove them and allow them to drain and cool. The skins are removed quite easily, then they are cut up into bite size pieces and set aside. Next I take several, I mean lots of garlic and slice it as thin as possible then set it aside. Now I grab a couple Vidalia onions, which I slice and rough cut, also putting aside. One of the herbs I have growing on the deck is basil. Basil is one herb that is a perfect compliment to the tomato. So I'll grab some of the basil and rip the leaves in half and place along side the other ingredients. In a large pan I'll place some Olive oil and start to heat the oil. I then add the garlic and onion. Cook these two for a few minutes until the onions soften, being careful not to burn the garlic. Then add the cut tomatoes, salt and crushed red pepper to your taste and the basil. Cook all of these together for a half hour. This will give you an incredible sauce. It will have a nice chunky consistency with super flavor. I still have some deer from last seasons hunt in the freezer. And if I sort through it I can find a nice piece of tender venison that can be fried quickly and be so tender. I take the deer slice it into serving size pieces, drop it into a hot skillet. When almost done, being sure you can still see rare meat add some of the tomato sauce to the deer and allow to cook a minute or two. Serve immediately. Sausage and red potatoes baked in the oven with the same basic tomato sauce. So flavorful. And with out saying....meatballs. These were made with ground turkey, and they are awesome. Butter and honey. One is so smooth and the other sweet in natures way. When combined they can make ones cares go far away. I have the same feeling about a small stream and some of its wild residents. A naturalized citizen of these parts who has done his duty to bring pleasure and a few curse words to anglers who seek this true trout. The feeling of wonder when the sun breaks free and spreads its light through the forest and onto the flowing waters of the stream. A warm feeling like that of melted butter on a warm muffin. The light on the waters can make for very tough angling, but there are those dark corners and shaded eddies that like honey are the smooth, sweet spots. Such is a place where butter and honey mix so very well. The naturalized citizen. Butter and honey can be detected in flanks, fins and gill covers of this wild wonder. Who would have though back in 1884 with the stocking of the first of his kind would have created such a great quest. I enjoy matching wits with him each time I fish a small stream. Most times I can figure him out but there are those times when his tiny brain sends me walking away scratching my head. I do enjoy angling for this sweet and smooth trout. The "Stimulator". How many of us carry this fly in our boxes, and how many of you actually fish it? While many give credit to Randell Kaufmann for creating this fly, and he might have, others say that's not so. A fly fisher from New Jersey created it and fished it in his home state. Jim Slattery named the fly "Stimulator" after a New York City punk rock group by the same name. But the fly also bears a close resemblance to a fly called a "Sofa Pillow". The Sofa Pillow was created by Pat Barnes in the 1940's. When he tied it and showed it to a group of Texans he was guiding they said that fly is as big as a sofa pillow. Well no matter what you call it, or who you may think created it, I believe it should be a staple in your box. Tied with various colored bodies, usually orange, yellow, and green, or olive. It can be tied in large sizes 8-10, or smaller sizes 12-16. I prefer 12 and 14. It can represent insects from caddis to stoneflies, to grass hoppers. 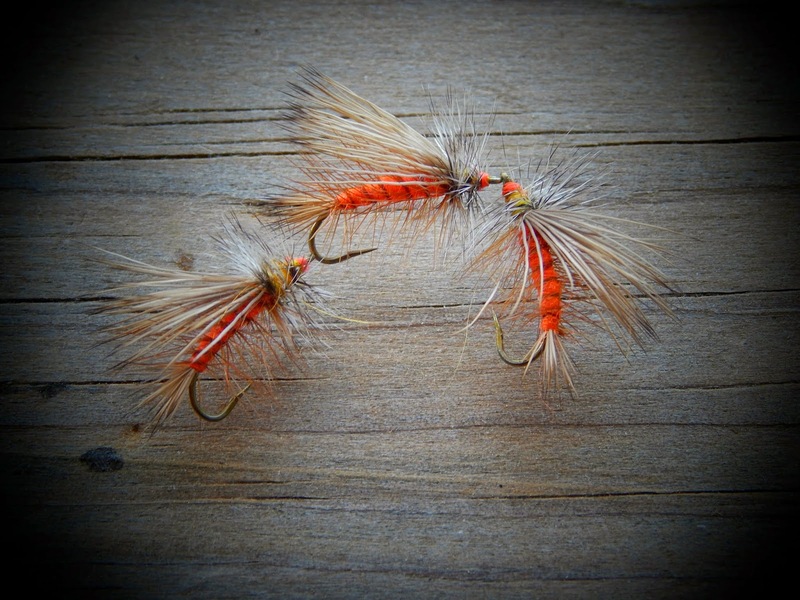 The orange dubbed body Stimulator is my favorite, and is a great color for Autumn brook trout. This is an front end view of a Stimulator in action. This fly does just as its name implies. On streams just as this the Stimulator shines. Weather allowed to drift naturally or skated across slack or swift water it can bring some violent responses. This wild jewel found it hard to resist all that hair and hackle. You could say he was stimulated by the "Stimulator"
A stream I'll figure out one day. There are some streams that are very difficult to figure out, and this one is just that. This is my second time fishing this lovely stream in northwest Connecticut. It has everything needed for wild brook trout from ample cover to those series of riffles, runs and long fairly deep pools. It also has those beautiful undercut banks along with a few log jams. It's a stream that runs through a pretty flat plain so the swiftness of a higher gradient stream is lacking. It's a very picturesque stream with flowers and foliage growing to the stream. I've never witnessed any insect activity, but there has to be at certain times. The only rises were that of small river dace. The dace I saw this day were incredible, there were schools of them all over. I think a streamer fished in this stream at dusk would bring some large brook trout to hand. I fished the stream for several hours. The usual places brought strikes and a few hookups. The brookies took a variety of patterns this day from bombers and parachutes to picket pin wet flies. I did try a streamer, a Mickey Finn but there were no takers. Like I said I was able to bring a few to hand. 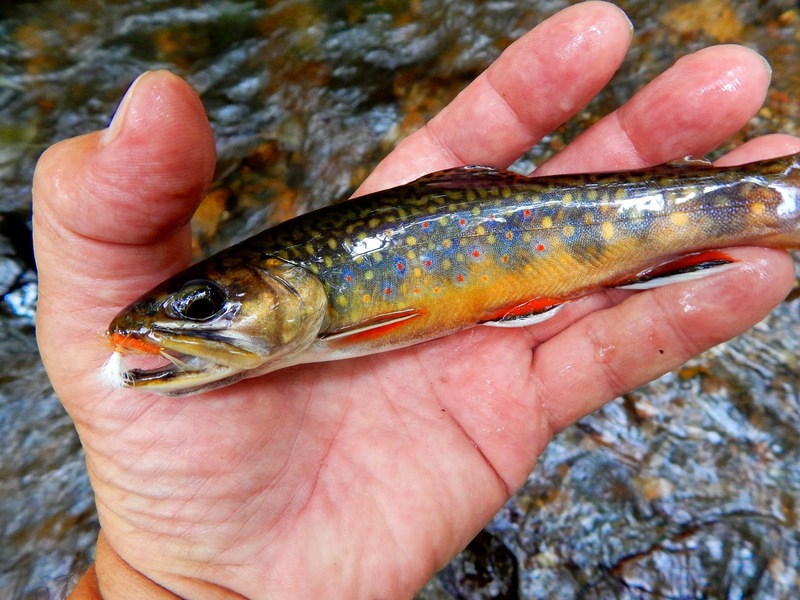 Healthy robust brook trout settled into their summer colors. I took fish from the riffle at the head of this pool as well as the tail where the foam formed near the fallen tree. A bomber and a brookie taken in some riffles.......how often that happens. In this beautiful stretch of water I spooked several fish, and to my surprise took a brookie in midstream in the clearest of water. This brookie had a odd shaped head, almost snakelike. I'll probably fish here again come late summer or early fall and see if I can figure it out. The "Waltons", Barbeque, and a visit to "Harry Murrays"
With our trip to Virginia we had planned a stop at "Waltons Mountain" which is actually in Schuyler VA. The home pictured above is the actual home of Earl Hamner the creator of the Waltons. Both Jeanette and I are big fans of this series and to visit this place was very enjoyable. There is a museum housed in the school that Earl Hamner attended. It has all of the furnishings of the Walton TV home set up in their respective rooms. They even have the Baldwin sisters "recipe machine". It's an actual still that was confiscated locally in the mountains. No samples of the "recipe" were available. Ike Godsey's store. This is the site of the original store, unfortunately it burned down several years ago. The Walton living room. Original furnishings. Some local color in the form of barbeque. This gent was fixing some pretty good stuff. He told us he starts about 2am with the smoker, and lunch is ready at 11am. He had pork shoulders, ribs, and some awesome sausage. All of his meats are local, as is another prime ingredient the wood that fires the smoker and imparts a flavor like no other. I wish I had a couple of these now. By the way he operates right on the street in what looks to be an old fire house. Right next to the barbeque place is another local establishment that is known world wide. "Murray's Fly Shop". I spent some time in there talking to Harry Murray who is very knowledgeable about fishing Virginia, especially Shenandoah National Park. The fly shop is fully stocked and very neat as well as organized. While shopping he was with me telling me a books worth of information about the fishing at SNP. One of the things I was truly impressed with was the wall of photographs of Shenandoah. These were taken at various times of the year and at many locations in the park. I couldn't leave with out a purchase. The autographed book is wonderful. A great deal of info in it, with some side notes. The maps are the best resource for fishing as well as hiking the park. A few patterns from his shop. Mr. Rapidan, peacock caddis, and a sulphur dry. These flies were very well tied. And a hook file. This file is so very well thought out. It has three sides and all that is needed is 3 draws against the dull hook and your ready to hook and hold. Yesterday I had intentions of fishing a small stream that has been good to me in the past. As I was driving to this stream the sky opened up, and the rains came swift and hard. The forecast was for the "showers" to be out of the area well you know how that is. When I pulled up to the stream it was still raining pretty good so I had a cup of coffee and waited the rain out. It's real nice listening to the rain as it hit the metal roof, it almost makes you forget why your here. Eventually the rains subsided and the sky seem to brighten. I got the gear together and off I went. The woods were soaking wet and so was I in short time. The stream was in wonderful condition, not even a bit discolored. I tossed a bomber out and was soon greeted by a hungry brook trout. There were a few rises going on and there were sulphurs about. I tied on a orange bodied parachute, which was the only other fly used today, and proceeded to take several of those rising fish along the way. Every stream has those places that are just fishy. Sometimes they produce and other times they are void. This is one such spot. I love this run, it flows fast and deep into an undercut. As the fly floated near the undercut it was hit hard. A few moments later this wild jewel was at hand. Its colors were striking, and those blue halos incredible. Continuing on I managed to fool several more brook trout. They could be found in their typical places. This male was taken near the woody debris in the previous photo. This was the only photo I got of him, for he tossed the fly and was gone. I was impressed with the shape of his body. He possessed that pronounced hump on his back that you see on few brook trout. He also had those blue halos. This guy is going to be spectacular come autumn. A day that started wet finished up to be dry, and very productive. Last Tuesday Jeanette and I left for a week to visit Shenandoah National Park. This has always been a destination for me in which I planned to fish for southern Appalachia brook trout. But on this trip I did not bring one piece of fishing gear, this was to be a time for walking, and discovery of one of the most beautiful parks in the nation. Shenandoah was created in the nineteen thirties and built in part by the Civilian Conservation Corps. The road which travels through the park is known as Skyline Drive and offers one views that are awesome. The park is full of history, both man made and natural. There are many trails that can be enjoyed, including easy peaceful walks as well as difficult strenuous hikes into the back country which is a designated wilderness. We truly enjoyed our visit here and will return again in the fall, this time with a 3wt. With ample rain the mountain woods were lush and green. There are so many peaks that were not visible to us because of the weather, which featured some thunderstorms and fog. Mountain Laurel was in bloom and the flowers through out the park gave us every color there is. A natural rock tunnel....I guess it's safe. This meadow was one of the gentler walks. Deer could be seen heading from the grassy fields to the wood line with their young. This is a walk that required a little bit of navigation. There was Lupine in bloom as well as these beautiful tiny yellow flowers. All along the ridge were these wild strawberries. These berries have the most sweetest taste, and leave the nicest fragrance on your hands.....We were not the only ones enjoying the wild strawberries this day. We came up on this fellow eating berries like there was no tomorrow. We stood there for some time and he did not notice us because he never looked. I decided that it's best to let him know we were there so as not to alarm him, and give him a chance to flee. So I whistled and he looked up saw us and quickly left. Sometimes this is safer than wild berries. A small stream, a wild small stream. This one flows freely over rock and fallen tree. A miniature version of a river flowing through a wilderness. I choose to fish these miniature wilderness streams because they offer me the quiet and solitude to fish. This is rare in these days of "hot fly fishing destinations", large trout, and large crowds. To reach these streams does not take a great deal of effort, only forethought. A respect of these waters is a must for they are as fragile as a crystal vase. There is not a great deal of tackle necessary to fish these streams. The fly box need only a few patterns, especially this time of year. A fine 3wt rod, and an open eye as well as an open ear will bring the angler as close to nature as one can get. Come join me on a recent June morning as I fish this mini wilderness stream. A 6ft 3wt and a few flies. As it turned out I could have had only one fly and it would have been enough. The "bomber" was the star. Flowing ever so peacefully the stream offers its bounty. The bomber bounces and bobs along the runs. One day the waters behind a boulder will offer up a beautiful wild trout, the next day it will be void. On this day the spot behind the boulder offered this wild brown. His size does not say it all. Inch for inch this trout will rival any. He was so determined to gain his freedom that he ran upstream with vigor. After getting tangled in this fly trap twice, I managed to finally get a free drift. Just in front of the rock the fly was pulled under. The rod did all it could to keep the fish turned away from certain early release. I slid my hand in the cold water and lifted this wild gent up. I managed a photo and off he went. A salute to this day and to the mini wilderness stream and its wild residents.